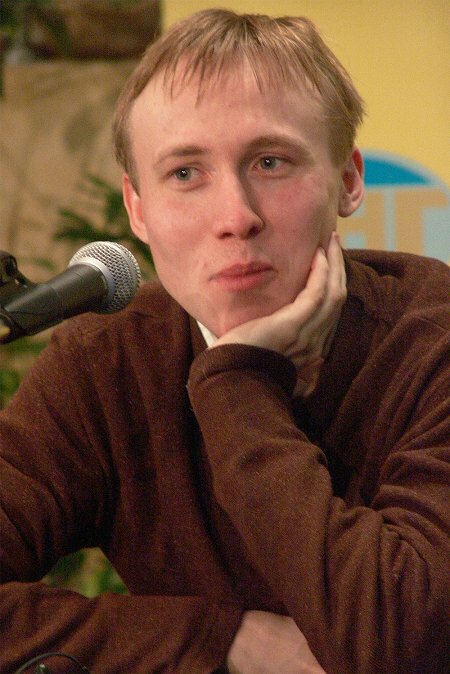 This shy boy impressed chess world once again by entering in the final of the World Chess Cup 2005. 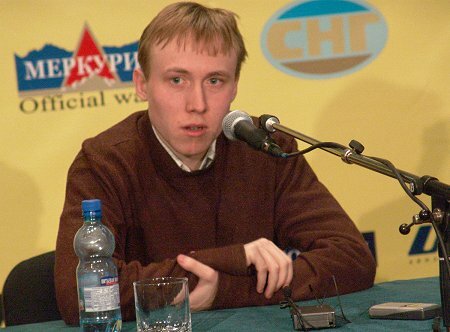 Now he has a unique chance to become the second chess player in the world who managed to win two the most prestigious knockout tournaments. RP: Seems so, but it is not true. Practically, a real fight began from the first games, although they were not interesting for the audience. There are some objective causes for it. The tournament is already lasting almost 3 weeks and players’ energy has some limit. You try to be accurate, focus on a long struggle not on the one strong move, because risk is big with consequences that could lead to losing and elimination. It is necessary to get use of your opponent’s weak points as, for example, Levon Aronian managed to do in another semifinal match against Bacrot. It came out that both of us Grischuk and me decided not to risk during games and let the tie-breaks identify the winner. Tie-breaks have their own specifics – playing with such time control both players will certainly make mistakes. And the result of the game depends on who will get use of them… The first game was very difficult. Grischuk deceived me just by the first move: usually he starts with 1. e2-e4, and that time used closed opening. Some difficulties appeared: I had to lose time trying to remember the theory. As the result, I didn’t manage to remem-ber the theory and made mistakes because of time trouble. After 26...c5? 27.Gb7! I had to make such a difficult choice: whether to sacrifice two pieces for the rook or to let the opponent organize strong passed pawn. I chose the second variant. Then I was forced to be creative in order not to lose the game: make series of active moves that could create some problems to the opponent. Grischuk didn’t expect that and, due some reason, was at lost. At the end I managed to recollect thoughts and find a variant that unexpectedly to both of us led to my win. RP: Yes, and even a draw was also enough for me. Nevertheless I chose attacking tactics. Grischuk has active style, he likes and can attack. So, he doesn’t like to defend. And my moves put him out of countenance and he lost almost without any struggle. – Now you have to fight for the World Cup against Levon Aronian. What can you say about him? RP: Here he plays great. Levon had only one difficult match against Vallejo where Spanish had advantage. They played tie-breaks. I don’t have enough time but I will try to watch his games in order to prepare myself. And I should gather myself up. Today he has rest and I had to play such difficult match. Any way it is not scaring already to lose. You don’t lose the first round but the final. We have great motivation, unlike other players who fight for 15-16 places. – Do you remember what your score against Aronian is? RP: Let’s try to remember. I have never won Aronian. First time we met in 1994, at my first international tournament. There he had the first place winning me in the personal match. Then we played in Lausanne. I played against him and lost once again. Later, we met one again at the European Championship in Ohrid: I was play-ing carefully and we had a draw. So, last time we played in 2001 and since that have not met. I should note that Aronian succeed-ed a lot and that influenced on his Elo rating. – In the quarterfinal you met the strongest player Evgeny Bareev. Can you comment that match? RP: I didn’t have serious problems. We have similar styles so I understood Bareev’s play. I even could predict most of his moves. In the first game he didn’t introduce anything in the opening and at some moment I got chances for getting advantage. But I decided not to risk and the result was a draw. In the second game I managed to guess the opening. While preparing to the game I noticed one interesting point: Evgeny plays two openings – French and Caro-Kann, and usually alternates them. So, if today he played 1…e6, then tomorrow it should be 1…c6. Last time we played in Moscow and he started with Caro-Kann... It was not difficult to found out what would happen in our game. Besides, he used variant that was played in the game against Carlsen. I used a novelty and then Evgeny made mistake 21…а5 – bad idea after which I got strong knight against Black’s bad bishop. At the end I managed to prove my advantage. – At the Championship in Moscow you were a young chess player, so nobody expected something extraordinary from you. Here you are a favourite. Can compare your impression of these tournaments? RP: These two tournaments were difficult. Here pairings is easier, but at the same time my rating is higher now then it was. From the other point of view, such strong players as Volokitin and Ivanchuk, who could be my competitors, lost. Any way, one should take into consideration psychological side. You play 2 games: with Black you should defend and with White you should use a novelty to put opponent out of countenance. So, in every case we have to be nervous. But I think that it was more difficult in Moscow… The reason is that I feel myself much comfortable due to the experience of participating in the knockout tournaments. Before Moscow-2001 I had participated in the World Championships in Las Vegas, India, in the tournament in Lausanne. So, now I get used to this system. But everything could happen. Note: nobody, except Anand, has won this tournament twice. If you made one inaccuracy, have a bad day, you will return home. – Here, like in Moscow, you won the majority of Russian team. Why do you play so great against Russians? Maybe you have some secret? RP: I want to defend my country image. Somebody should do it! As it is too many Russians are participating in the World Championship. – Do you call someone in Ukraine while being here? RP: No, unfortunately. I’m waiting for the end of the tournament so I will come to Kiev. I miss my family, it is difficult to get used to that feeling. Sometimes you spend half a year at home; sometimes you participate in the tournament during the same period of time. At the moment I have such a period. I even couldn’t celebrate my birthday, so, most likely I will do it after New Year. However, my relatives are satisfied with the way I play. – We suppose, celebratory dinner is waiting for you any way. RP: It is the most necessary thing for me now. Recently I notice that I lost about 5 kilos during the tournament. What can we do? The reason is nerves. It is not a problem: at home my mum will feed me. – After one of the games you visited local art gallery. Do you like it? RP: I tell you more: it impressed me much. It is clear that it is difficult to gather such a collection: you need sponsors and support from the Government. In the gallery I got some energy while staying at the holy icons. I hope that it will help me in the final.